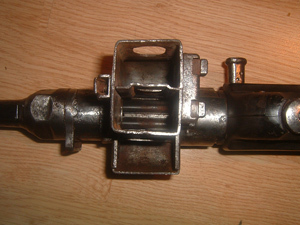 14-11-2010: Today I added a small page about the Waffenmeister's spare part box. The so called "Gross Vorrat M.P". 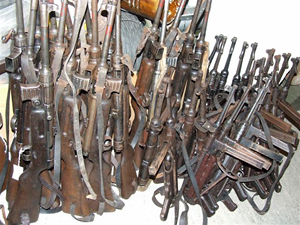 This would mean somthing like Large supply for sub-machineguns. 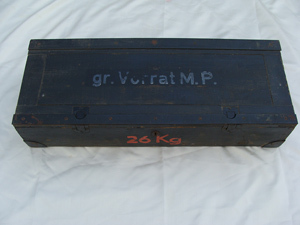 This box contained the spare parts that the Waffenmeister needed to do field repairs. 08-10-2010: These pictures below were sent to me by a french collector who has been offered this mp40/1. Not in mint condition but still great to see that these are still around. This is actually the third I know in private hands. I know one in the U.S.,one in Austria and this one in France. Interesting to know is that these MP40/1 are not completely build in serie. 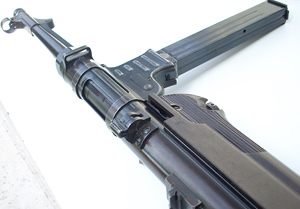 They pulled back randomly some MP40's and then fitted the double magazine receivers on them. That is the reason why some are made by Steyr and others by Erma. Also from different production years. This MP40 is still called MP40/2 by a lot of people but this is WRONG. It is officially called the MP40/1 as stated on the official Regulation D 97 + "equipmentlist (Vorschrift D 97+ "gerätliste"). 06-09-2010: Two pictures of a very rare and early MP38 from 1938. I know of 2 other 1938 MP38's one in the hands of a private collector in Germany the second one at the WTS in Koblenz (Germany). 06-09-2010: Politely we say "we envy" Rolv V. with his collection but we are "stinking jealous"!!!!! I have shown similar pictures of his collection but this is the most recent version with a staggering 54 original pouches (See photo to the right)! 11-7-2010: Probably this list is not even complete but look at al the movies that is featuring the MP40. Actually the movie that triggered my passion for this submachinegun is also in the list. It is "The bridge at Remagen" from 1969. I watched this movie on a Betamax VCR in the early eighties for the first time and after that another 20 times! One of my most favourite scenes featuring the MP40 however is a scene from Indiana Jones and "The raiders of the lost arc". 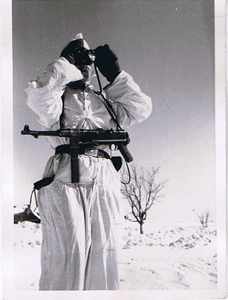 At a certain point a fellow from the SD fires an MP38 or MP40 in Caïro, Egypt. The exaggerated sound is simply fantastic! Also interesting to see an MP38 in 1936. This is when the scene supposedly plays. But who cares! 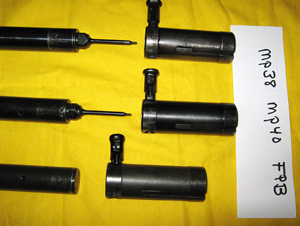 11-7-2010: Very nice MP38 parts for sale at gunbroker. 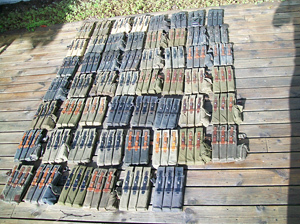 25-06-2010: Another batch of MP38's, MP40's and MP41 is entering the market. The batch to the right comes from Slovakia and will be sold on the Market. Unfortunately all of them have to be officially deactivated. I do not have anymore details about who is going to offer them. I received this picture from one of the readers of this website. 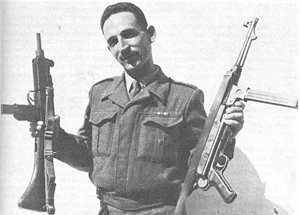 19-06-2010: A unique picture of Major Uziel Gal holding the famous by him designed and invented Uzi Sub-machinegun with wooden stock and a MP38. 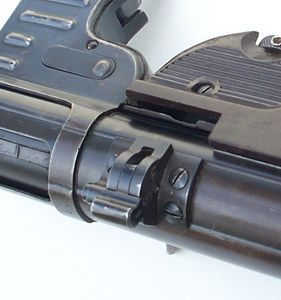 Major Uziel Gal copied some of the features of the MP38/40 in his design. 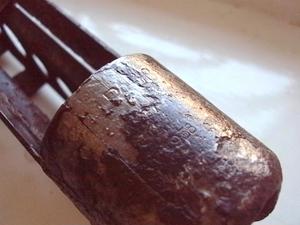 For example the collar nut that locks the barrel to the receiver is almost an exact copy of the sytem that the MP38/40 uses. 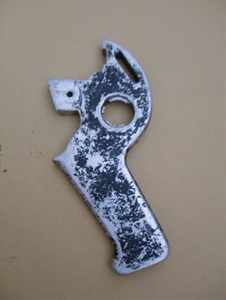 The Uzi is usually called a third generation sub-machinegun. 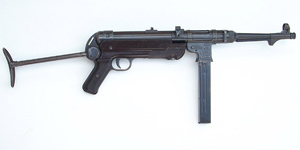 The mp38/40 is considered a second genration submachinegun. 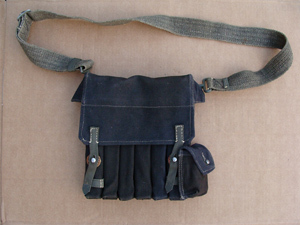 Uziel had easily acces to the MP38/40 since the Israelian Army used the MP38/40 right after the second world war. 13-6-2010: A Fantastic detailed picture (to the right) I recently bought of a German soldier in Russia in 1942. 13-6-2010: Slowly but gradually the MP40 list is growing. Soon I can do interesting data mining on it since the numbers are getting more representative. In total there are now 367 MP38's, MP40's and MP41's. Please keep on sending me those serial numbers! 10-6-2010: This MP38 was for sale (for 1 day) at Raskantik and was sold almost immediately. 1-6-2010: a very nice late Steyr MP40 with the rare red Bakelit found in a lake in Germany. 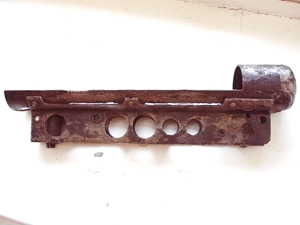 30-5-2010: I recently received these pictures of a MP40 with a so called "Blocksicherung". This is the first time I encounter one of these. I know there is a MP38 on display at the WTS in Koblenz (Germany) with an experimental safety but I have never seen one on a MP40. This version looks a lot like the safeties that were build on the MP18, the MP28 and the Erma EMP. It's in fantastic condition. Check the cut out in the Bakelite. I added the serial number to my listing. 29-05-2010: Very nice detailed pictures on a Russian website of a MP38. 10-04-2010: 331 MP's is the total of the updated MP38/40/41 list. Way too short if you ask me. There must me still thousands around. Please keep sending me those serialnumbers and codings. If you want the Excel file then please let me know. 23-03-2010: Some really interesting items for sale at http://www.raskantik.com/ an MP41, an numbermatching MP40 and the ultra rare D167/2 Manual!!! A bit off topic but also an extremely rare ground dug VG1-5. 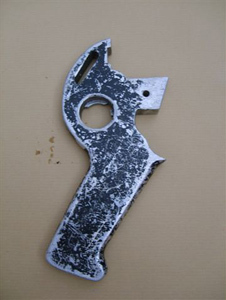 16-02-2010: For sale at gunbroker.com, by the looks of it, an unissued mp38 grip in mint condition. 15-02-2010: I'm almost sure that it is fake or a "put together" since none of the parts match. 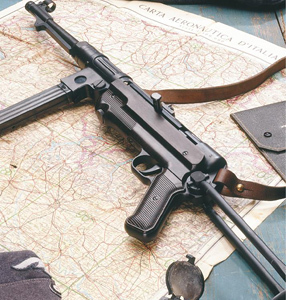 But it's intersting to see that this mp40 has a mp38 magazine release button. 02-02-2010: I received a lot of response on the topic below. 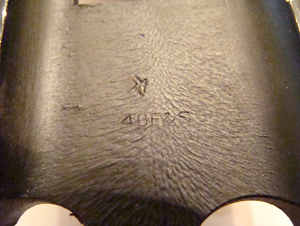 Indeed the 40F&S stamp on the inside of the mp38 grip of Erma (27-40, ayf-40 and ayf-41) is the code for Fichtel and Sachs. F&S was a manufacturer of motor cycles an terrain vehicles. If I'm correct they also produced bajonets for the K98. More info: http://en.wikipedia.org/wiki/ZF_Sachs The the FS code, stamped on the bottom of the receiver is the reseller stamp of Sauer Militaria. What a coincidence!